Yesterday, on 7 April 2018, people in Russia celebrated Orthodox Easter Day. Students from the Faculty of Arts and Design of Altai State University prepared two two-meter Easter eggs for the Easter Art Festival in Barnaul, as an Easter egg is the main symbol of the holiday. For the design of Easter symbols the young designers used mosaic and collage elements, applique, in addition to painting. The style and decoration options were agreed with the Barnaul Diocese. For example, students majoring in applied arts and folk crafts, chose Byzantine heritage and Byzantine mosaics as a theme for their work with the art object. "Before we started working, we had thoroughly studied the features of Byzantine mosaic style, examined how they used to draw doves, bunches of grapes and other elements regarding Christian topics during those times. We made a sketch, and painted our giant Easter egg with acrylic paints in accordance with it. In addition, we washed it with varnish for two times in order to secure it from the bad weather, since the object of art was then exhibited in the street near the church," said Assistant Professor at the Department of Russian and International Art History of the Faculty of Arts and Design at Altai State University Natalia V. Grechneva. The second Easter egg was painted by master’s degree student majoring in decorative and applied art and design Ekaterina Yakubovskaya. In her project she used elements of Zhostovo painting with a typical black background and a bright floral bouquet across the entire surface, in which large garden and small field flowers alternate. The composition was crowned with the golden letters “ХВ” that mean “Christ has risen” in Russian. The Easter eggs prepared by the students of Altai State University were exhibited in the framework of the Easter Art Festival. All in all, the visitors of the festival could see 20 Easter eggs, including the ones painted by ASU students. It is to be noted that the Easter symbols were assessed by judges at a competition, which was a part of the festival. 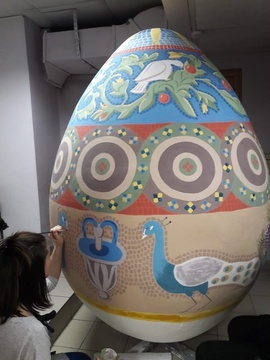 Following the results of the competition, the group of students that worked on the Byzantine egg took the 1st place, while Ekaterina Yakubovskaya, who painted the Zhostovo egg, received a diploma for the high level of her work.